After four years of studying and working for your degree it is time to revel in your hard earned work with friends and family aboard a private cruise in Newport RI. Finally, sit back and relax, you’ve completed your education! Enjoy an afternoon of sailing on the water and finally seeing another side of Newport, the outdoors! We offer the prefect graduation venue for a classy graduation party for a special graduate or group of graduates. 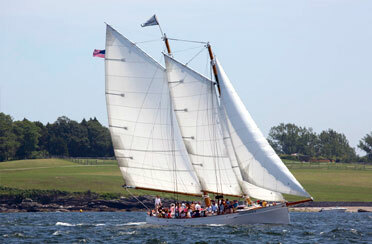 Sail with us in Newport RI with your friends and family aboard one of our classic boats for this special day. Cruise with us into Narragansett Bay while you finally get to kick back and relax with a glass of Champagne in hand and the wind in your hair. Take in the moment to reflect on the past and set your goals for the future. This is a unique graduation celebration venue and is sure to make a lasting memory for you and your guests. The Schooner Adirondack II can host up to 57 guests, while the Sloop Eleanor can host up to 24 guests. Both catering and bar packages are available. So book your graduation venue now and celebrate with us in Newport RI.